MARINE CORPS AIR STATION FUTENMA, September 12, 2013 – Two MV-22B Ospreys completed the longest distance Osprey tanking mission to date in the Pacific region Aug. 2-5, beginning from Marine Corps Air Station Futenma and ending in Townsville, Australia. The aircrews conducted aerial refueling operations during tanking missions to extend their flight range, reducing the number of required landings and shortening the mission timeline. Two KC-130J Super Hercules refueling aircraft supported the Ospreys during the record-setting flight. The KC-130Js are with Marine Aerial Refueler Transport Squadron 152, Marine Aircraft Group 36, 1st Marine Aircraft Wing, III Marine Expeditionary Force, and the Ospreys are with Marine Medium Tiltrotor Squadron 265, MAG-36, 1st MAW, III MEF. The flight demonstrated the aircraft’s long-distance capabilities and the advantages it provides over traditional helicopters, according to Gunnery Sgt. Wade M. Davis, an MV-22B tiltrotor crew chief with VMM-265, MAG-36. The Ospreys flew to Clark Air Base, Republic of the Philippines, Aug. 2 before flying to Darwin, Australia, Aug. 3 and finally to Townsville, Australia, Aug. 4. The Ospreys rendezvoused with the USS Bonhomme Richard Aug. 5 where they remained, while the KC-130Js returned to MCAS Futenma. The introduction of the Osprey to the Marine Corps has increased the operational agility of units and expanded their response capabilities, according to Capt. Timothy E. Osterhout, a KC-130J pilot with VMGR-152. “As long as they have a steady supply of fuel, the Ospreys are capable of moving across even greater distances,” said Osterhout. 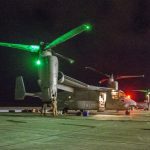 Being part of such an operation served as a memorable experience for the crew because of the history they helped make with the Osprey, according to Lance Cpl. Justin F. Montgomery, a KC-130J fixed-wing aircraft crew chief with VMGR-152. Due to the success of the flight, more long-distance Osprey missions are likely to occur in the near future as VMM-265 continues to expand its capabilities.